Does this conversation sound familiar? It sure does to me. My days were so busy and hectic that I had no time to care to notice something other than the task hand. At the end of each day I wondered where the day went! I had always lived that way, until recently. A few years ago I changed jobs to one which allowed me to have the summer off. After 20 years of working year round, having a few months off was strange, and even unsettling. After a week without I had no idea what to do with myself. I was ”forced” to slow down. It wasn't comfortable at first, but over time I started to discover that I was physically, mentally, and spiritually slowing down. As I was slowing down I found myself feeling more peaceful. As the summer progressed I no longer was anxious, I didn't rush, and I began to notice the world around me. I wasn't yet consciously aware of this, but I was beginning to live mindfully. As I slowed myself I focused my thoughts and attention to the present moment. No longer was I dwelling on my past nor anxious about the future. Wow! What a change for me as previously I was the king of anxiety and worry! Mindfulness is commonly defined as: “a means of paying attention in a particular way; on purpose, in the present moment, and nonjudgmentally.” (Jon Kabat-Zinn) Personally, the two key phrases in this definition which I feel are important are “on purpose” and “nonjudgmentally”. To find our inner-peace we need to consciously make the choice to spend time every day focusing our attention on what is happening around us and within us. Our focus is not meant to judge what is happening, just to notice it, to experience it. As we become aware of our surroundings and inner self, we become aware of life’s joys and potential. In this state of focused awareness, we are enabled to see solutions; to see hope. The goal of mindfulness is for us to slow down enough to fully experience life. 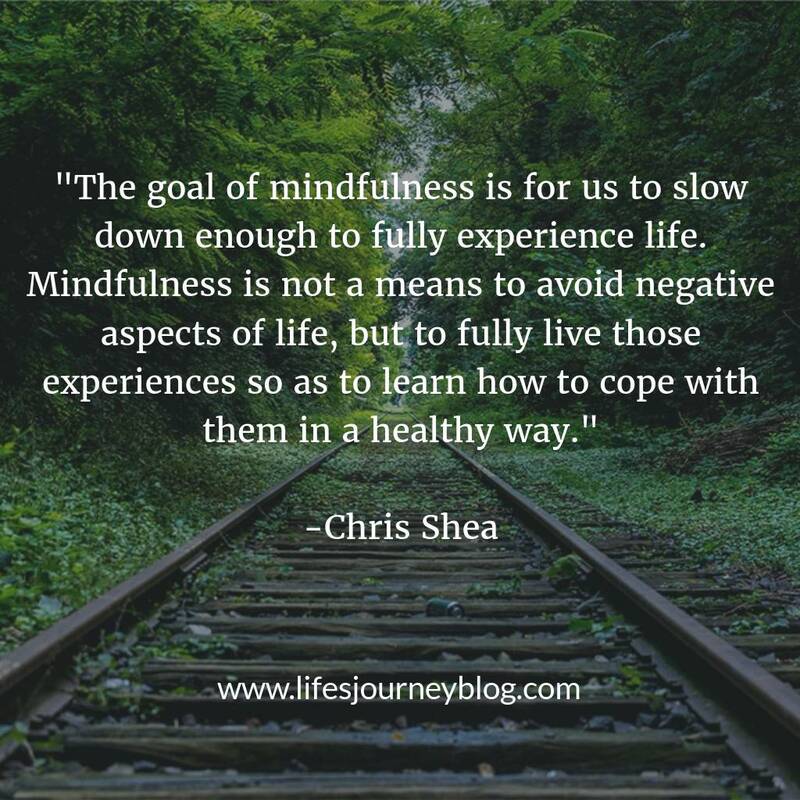 Mindfulness is not a means to avoid negative aspects of life, but to fully live those experiences to learn how to cope with them in a healthy way. Many of us try to avoid negativity, yet discover that we may be successful at avoidance for a time, yet once again we are hit with that which we were avoiding. Mindfulness asks us to be aware of all of our emotions, to feel everything, even the negativity. In so doing, we end up coping with what we at first wanted to avoid. Coping teaches us skills for dealing with future negativity in our lives. Living mindfully is a daily practice of noticing the little things. For example, one can eat mindfully by doing so intentionally, savoring each bite, and not rushing through a meal without truly tasting the food. During your commute, or rushing from one task to another, one can mindfully (intentionally) notice the details of the flora, buildings, people, cracks in the sidewalk, etc. How does mindfulness lead us to feeling peaceful? The short answer: mindfulness guides us to live in the moment, for it is only in the moment where we have “control” in our lives. By control, I mean our ability to change our thoughts and perceptions. If I allow my thoughts to stay in either the past or the future, I will suffer from stress and anxiety since I have no control over those time periods. All that I can do with the past is to learn lessons; in the future, all I can do is prepare, in the moment, for the unknown which has yet to happen. Therefore, keeping my thoughts focused on the present moment allows me to feel life to its fullest, while choosing the thoughts I wish to think. Spend time each day in meditation, whether it be in stillness or walking. Just 10-20 minutes a day will calm and center you. Each time my thoughts venture to either the past or the future, I consciously change my thoughts to the present moment. Spend time noticing the little things in life. Observe your surroundings, your feelings and your thoughts. If you notice that you don't like how you feel, our you are not feeling at peace, change your perspective and redo numbers 1-3 above. Always believe in hope, even if you don't feel hopeful at the moment. Hope and change is possible even without my belief in it.